Being one of the most colourful part of the sky, the Rho Ophiuchi Cloud Complex is a perfect target for astrophotographers having access to southern skies. This region is quite rich in nebulae, all sorts of them can be observed in the picture. In the upper part the blue nebulosity around Rho Ophiuchi (IC 4604) is a reflection nebula. Gas and dust particles around the triple star system reflect the blue light of the stars. The yellow part of the nebula (IC 4606) is also reflection nebula, light of the red supergiant star Antares is being reflected. Emission nebulae can also be found in this region, the red glowing ones. In contrast to reflection nebulae, emission ones emit own light because of the ionising effect of nearby young, hot stars. The brownish ones are called dark nebulae, because they neither emit, nor reflect light. They are thick dust clouds blocking the light coming from the stars behind. 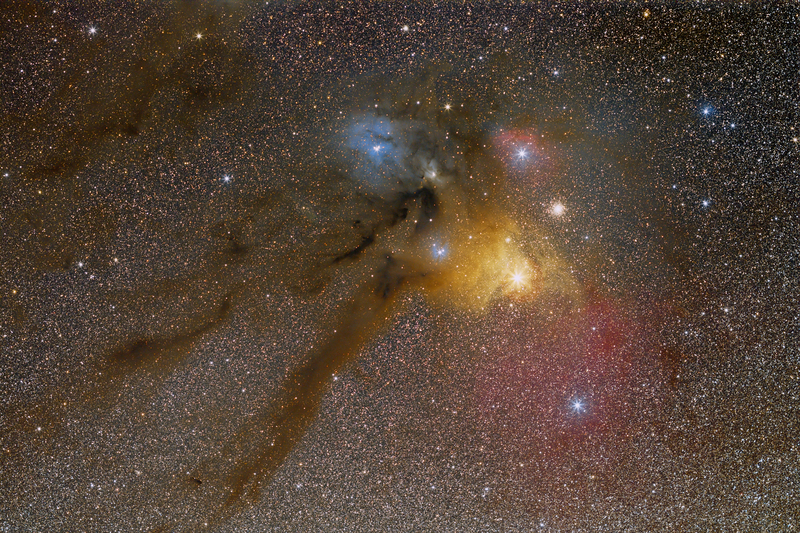 As one can notice, all the different nebulae in the picture are parts of the same, giant interstellar cloud complex, the Rho Ophiuchi Cloud Complex. The bright yellowish star is Antares, a red supergiant. Its name comes from the ancient Greeks, meaning 'anti-Mars' (Ares is the god of war in Greek mythology, just like Mars in the Roman one) because the planet has very similar colour. Antares is almost 900 times bigger than our Sun, its visual luminosity is about 10000 times of the Sun's. Luckily it is quite far from us, approximately 550 light-years away, so its enormous radiation does not affect us. Antares is the the most massive, thus the most evolved member of the Scorpius-Centaurus OB Association. The pace of stellar evolution depends on the initial mass of the star. Massive stars evolve faster than stars with lower mass.